I think zucchini is an amazing vegetable. You can create so many different recipes that you can have something different every week. I however have a very picky eater. We have many discussions over the topic of potatoes not counting as a vegetable and raisins not counting as a fruit. You can see I have a challenge on my hands but I do love a good challenge. He will however eat my Zucchini Fritters. I have a couple of secrets for your meat eaters of the family who you want to get a few more vegetables into their bodies. Shhhh, If you make these a little smaller they make great finger food for a party like the Super Bowl this weekend. Sneak in a few vegetables amongst the chicken wings. You can even serve them with a little something to dollop on top like a sour cream either made from dairy or cashews like I used for the Best Ever French Onion Dip or the Pumpkin Dip. 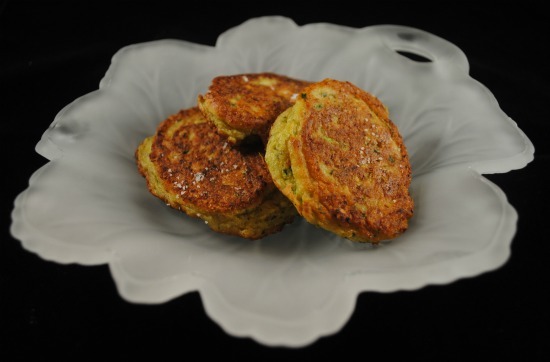 These are also great to make the same time you are making my Quinoa and Vegetable Stuffed Zucchini. You can use the extra insides of the zucchini that you’ve removed to stuff them. So the first secret is a little bacon or pancetta. I’ll crisp some up in a pan as a topping for the fritters and then cook the fritters using a little of the pancetta oil created. I realize this is like cheating but he’s eating mostly vegetables since I only cook up 1 or two slices of the meat. The second secret is if you also have someone who you have a hard time getting to eat vegetables, don’t shred the zucchini like is often done, finely chop it. I use the food processor. If you want to keep them completely vegetarian you obviously want to skip the whole pancetta step. You can use coconut oil and keep the healthy fats. Either way I don’t use very much oil in the pan as these are not deep fried, just cooked more like a pancake. Cut the ends of the zucchini off and discard. Cut the zucchini into 4 pieces. Toss them along with the other zucchini, onion and garlic into the food processor and pulse until finely chopped. Using a tablespoon from your drawer, spoon this batter into your heated pan with either the pancetta oil or coconut oil and cook over medium high heat until browned. Turn it over gently and finish cooking. These look absolutely delicious. Does anyone know if you could make them ahead and freeze? Tracy I've done this but reheating has to be like cooking them, not just in a microwave. Oven works ok.